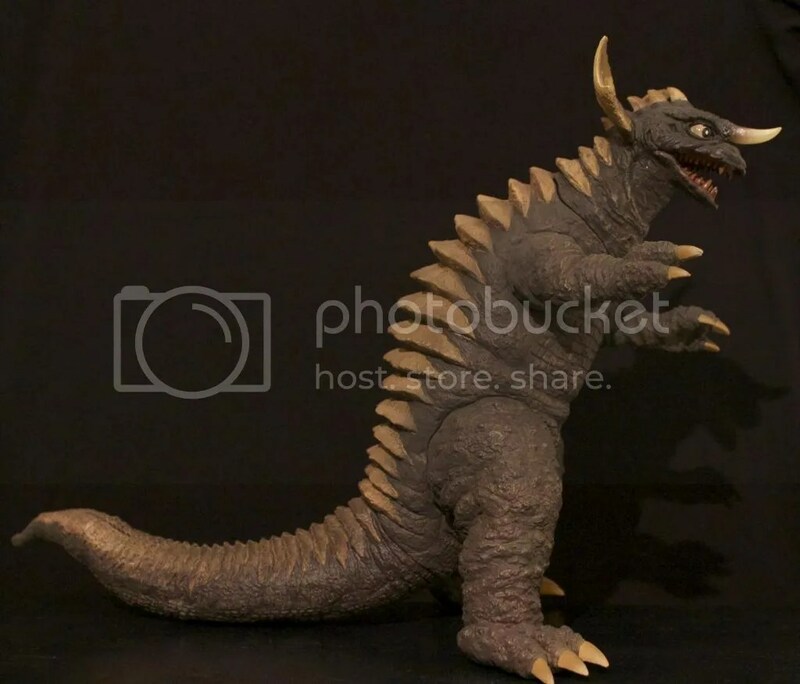 X-Plus 25cm Baragon RIC Boy 1965 (Standing) | Fresh Vinyl HQ! 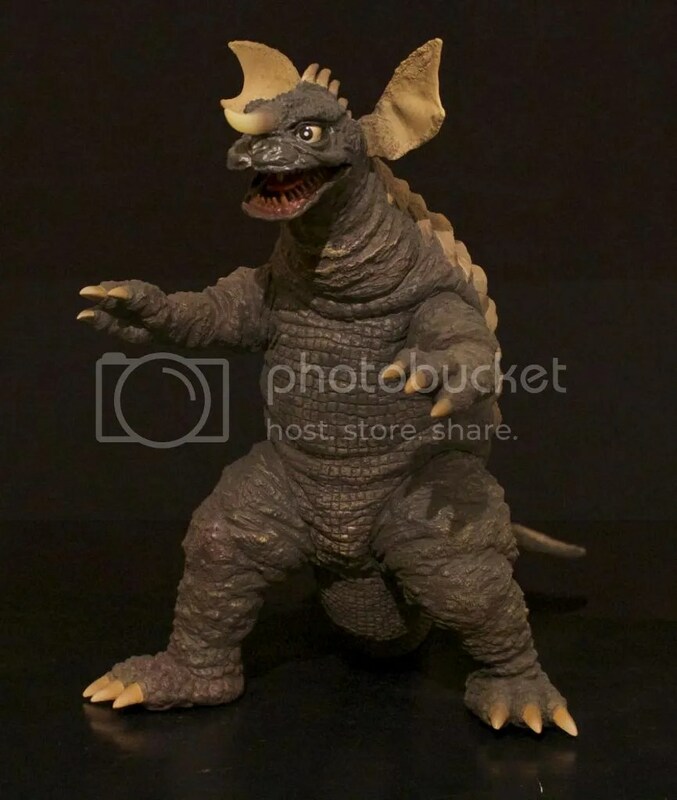 Hailing from 1965’s “Frankenstein Conquerors the World“, X-Plus released the standing version of Baragon in October 2013. Many collectors were excited for this version because it gave them a chance to add Baragon to their 25cm fold. 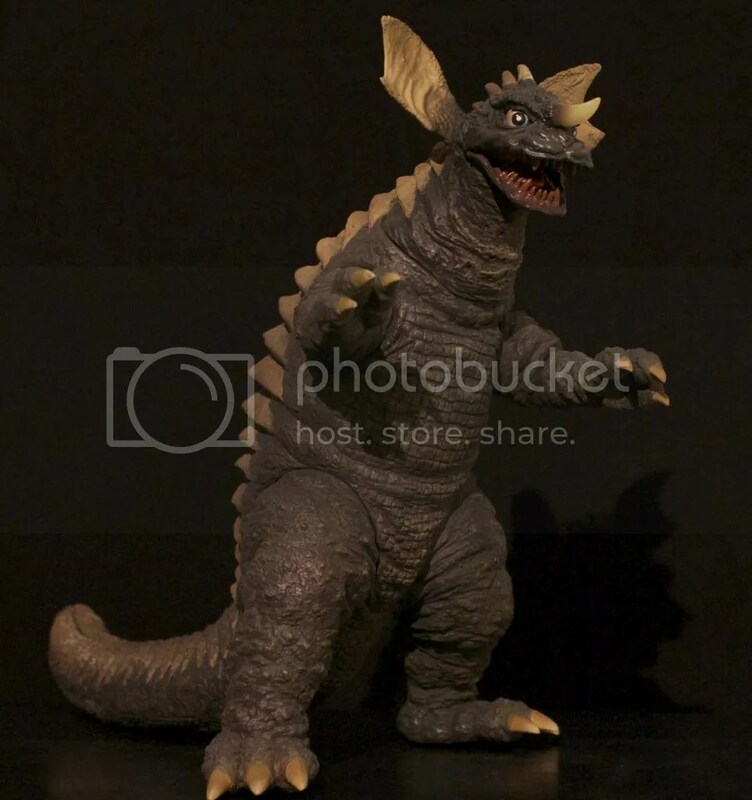 The original 25cm Baragon that came out in 2011 was in a quadruped stance, crawling on all fours. The crawling Baragon is very rare and highly sought after by X-Plus collectors. 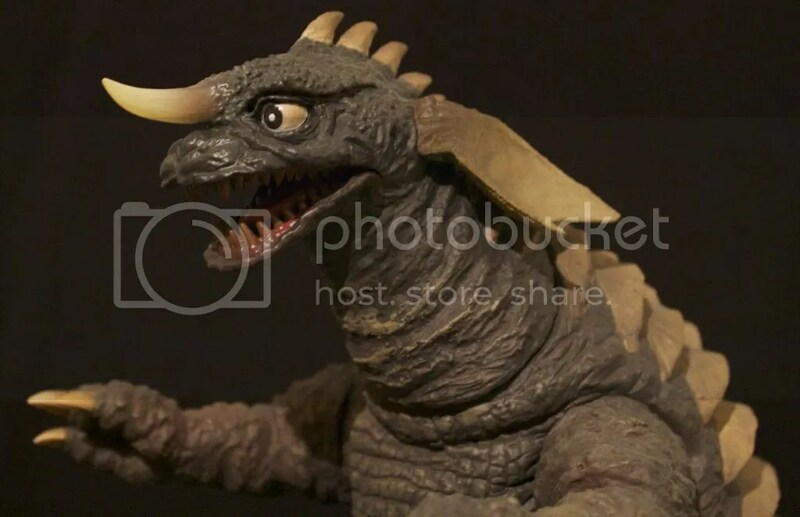 With this new release, even though Baragon is standing, at $95 before shipping, this was an easy grab for many collectors. Baragon stands rather tall for the 25cm line. If compared next to the 30cm Baragon, they are almost standing at the same height. Either way, the height does not hurt the figure at all. The detail is top notch. The way X-Plus has captured the look of Baragon is right on par for what X-Plus collectors have come to expect; FRESH! 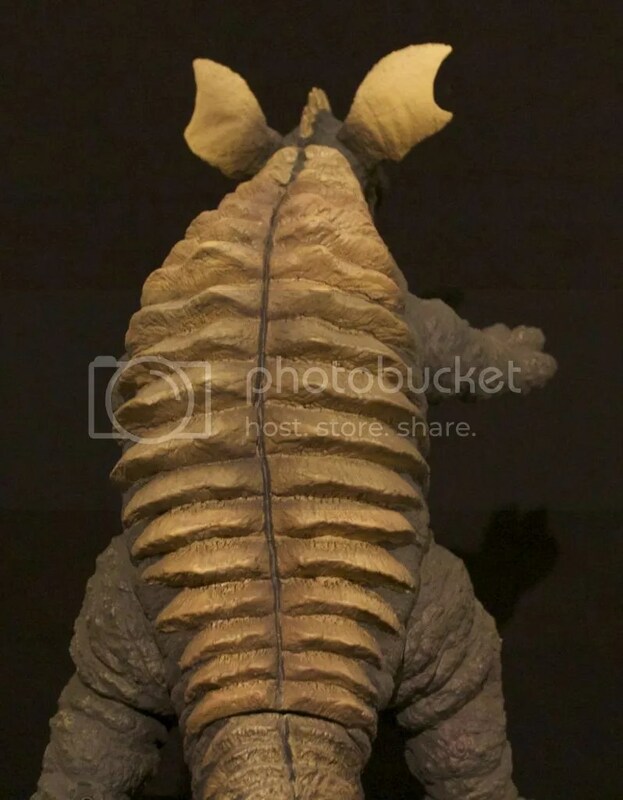 The frills on Baragon’s back are done exceptionally well as with the rest of his scaly body. His face, I can go on and on about his face because his face is done so well you feel like you are looking at the actual suit. Well done X-Plus, well done. The pose is pretty generic; standing static pose, nothing to special about it. The detail throughout the sculpt is amazing. 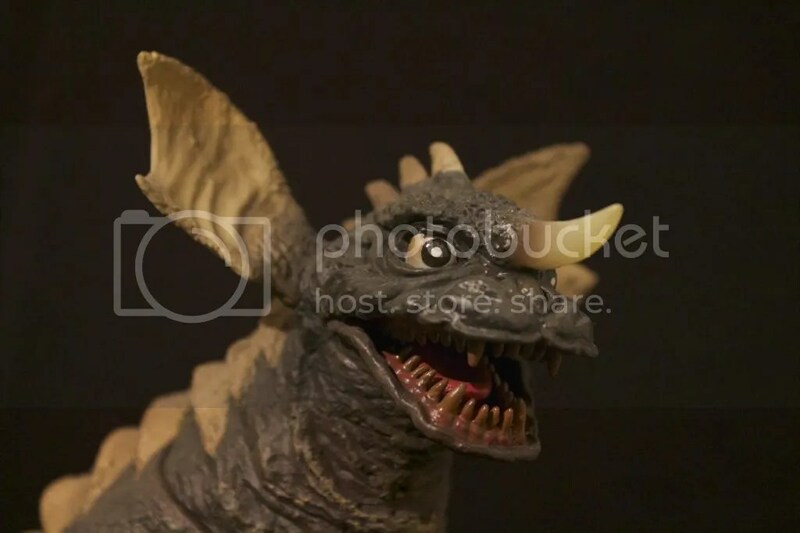 The face captures so much character on Baragon. The bulldog look he has is done so well that it makes you want to put a leash on him and take him for walk around your neighborhood. No, do not do that. Anway, the sculpt is done really well. Lots of detail on the face. The teeth look great as they are individually sculpted. Everything about this figure looks great. It’s frigging Baragon guys! There are seams on this figure that are somewhat distracting a bit. The legs, arms, neck and tail all sport seams. I have an explanation for the seams here on Baragon! 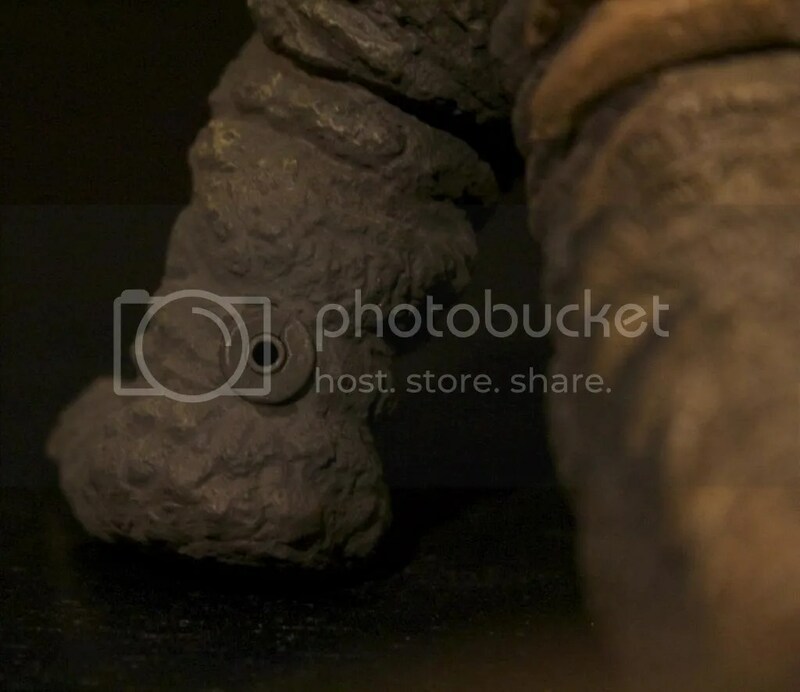 I believe there are seams because taking off specifically the leg and head, made it easier for the X-Plus assemblers to rig the wiring inside of Baragon. 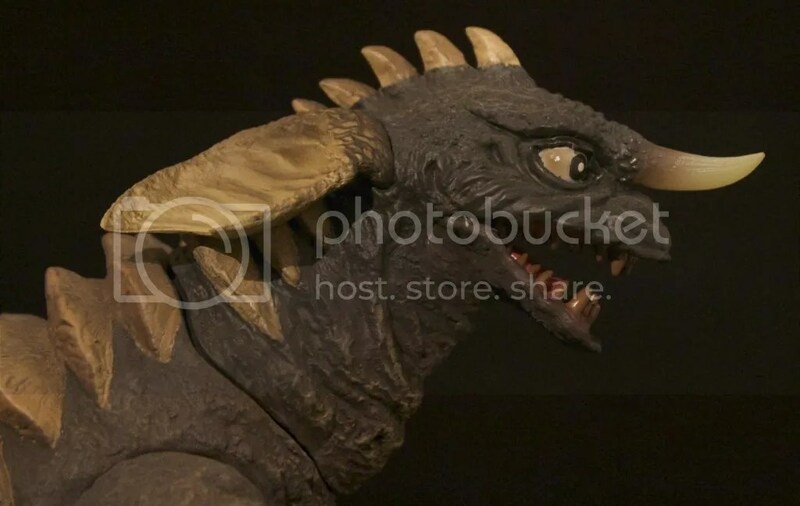 How else would they place an LED light in Baragon’s nose from the bottom side of the figure? So that explains that, BAM! Also, when putting the tail on, as always, make sure you get the hole on the body SQUISHY SOFT! While doing so, be careful not to aim in the same spot to long. I always worry that if I focus on the same spot with a hair dry while blowing the tail hole of a RIC light up figure I may damage the wiring. So, a good practice for any SQUISHY SOFT operations is to sweep the hairdryer constantly from side to side. Make sure you put the tail in the freezer. The cold will not hurt the vinyl tail, it will just harden. For heating up the tail hole on the body, as always, once you owned the hole and got it SQUISHY SOFT, shove the tail on with ease. Squishy hole and hard frozen tail makes for an easy assembly for getting the tail on. Anyway questions? ASK! The paint job features brown and tan applications with the finger nails, toe nails and facial features painted accordingly. I must say, Baragon’s beady eyes stand out pretty well! The eyes are just beaming forward as if Baragon has his sights set on Frankenstein. The teeth, tongue and gums are done very well too. The glossy pink painted on for the gum’s makes for a very realistic looking mouth. The standard version of this release comes with no extras. With the standard release, you get a box to take up room in your home and Baragon. That’s it! The RIC Boy release comes packed with an extra set of ears. The extra ears are perked up as if Baragon was very alert and aware during battle. Also included with the RIC Boy, Baragon is wired up on the insides and packs a light up horn. There is the basic battery black pack packaged inside as well. The battery pack is simply plugged into the heel of the left foot. The horn in some cases can be to bright. I think mine is just right. Then again, I do not turn it on all the time. Something to take concern to is how you plug the input of the battery pack in. If you push to hard, you could risk damaging the receptacle on the heel which could lead to a bad contact. Getting a bad contact can happen with normal plug in and out procedures. Mine is having this issue, which is very disappointing as I have only plugged in a battery pack maybe twice since I bought this figure. Do not force the input into the heel to strongly. Just a simple, light push will do the trick. Again, getting a bad contact could happen any, but it pays to be cautious. In my case, There is really nothing I can do on my own to try and fix the contact. NOT FRESH! Fresh Thoughts – This Baragon figure is certified FRESH! BAM!